Though I’ve been a vegan for 3+ years, I’d be lying if I didn’t say I’ve had (and made) some mighty good crawfish dishes in my lifetime. It was probably my favorite food back when I was a carnivore. I grew up about 100 miles outside of New Orleans and my maternal grandmother was born there. Her mother was grandmother was French so I imagine we’ve got a good bit of Cajun blood flowing around in us. They used to say the bravest man who ever lived had to be the first person to eat a raw oyster. I’m not so sure about that. I remember when a friend revealed to me at about age 12 or so that the best part of crawfish was sucking the heads (the brains actually). Though that sounds particularly gross to me now, I’m sure most of my crawfish-loving friends understand that that is truly a fact (though the tails appealed to me more than lobster). I wrote a lot of the Londons Times Offbeat Cartoons way back in my twenties and saved them in a shoebox in case one day I might use the writing for something. I didn’t have a clue as to what, but thought maybe tv or radio. And though I worked in both, never once was there a demand for my “little captions. 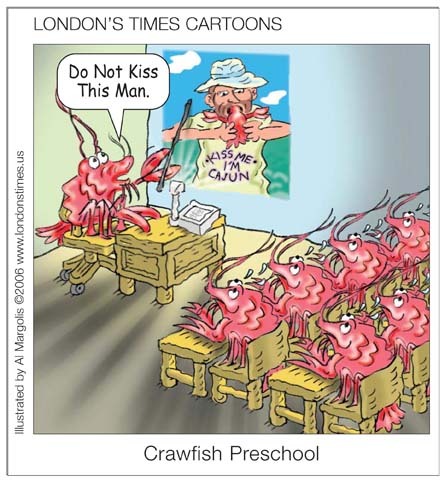 One might think the topic of crawfish would be one of those captions but alas, I didn’t realize until about 2006 that I didn’t have one crawfish cartoon in my arsenal of work, and even then it took another 5 months for the artist to get around to it. I’m glad he did as, though it is not necessarily one of our more popular offerings (a lot of the world still doesn’t know what a crawfish looks like much less tastes like), most of my friends back home near New Orleans often ask for this particular graphic. Happy haute’ cuisine, Hebert! To see this cartoon image on Rick London-designed products…….click on the blue box……. ————————————————————————————————————Rick London is a songwriter, author, cartoonist and gift designer. He is best-known for his launching of Google’s #1 ranked Londons Times Offbeat Cartoons and Funny Gifts. He is active in autism/Asperger’s, animal, childrens, and veterans causes.